Developed by Epson, a leader in sensing technology, the stylish, easy-to-use ProSense 367 helps you train like a pro with accuracy and training features for athletes of all levels. Monitor your performance with RouteSense GPS and CardioSense heart rate technologies, which display key stats on our premium, sapphire-glass, EasyView display. 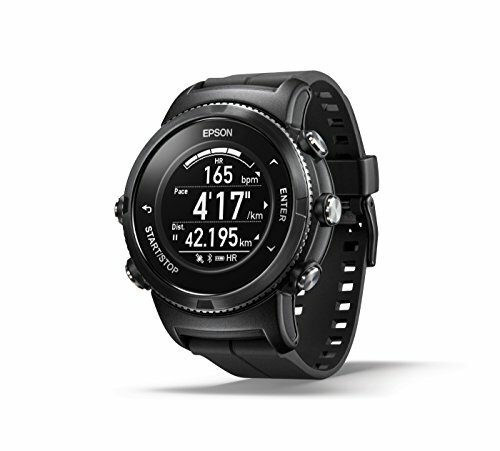 This sleek watch features the best GPS battery life in its class* — up to 46 hours, and tracks running, swimming, cycling and other daily activities, automatically transmitting data to the intuitive Epson View App** for analysis or goal tracking. You can even share data** on social media or popular running apps like Runkeeper or Strava. * Compared to popular GPS running watches within the same category in standard GPS and heart rate tracking mode as of June 2017. User customization may affect battery life. ** When paired, via Bluetooth, with a smart device (iOS and Android). *** See our website for convenient and reasonable recycling options. **** SmartWay is an innovative partnership of the U.S. Environmental Protection Agency that reduces greenhouse gases and other air pollutants and improves fuel efficiency. Ultra long GPS battery life, #1 in its class* - up to 46 hours with GPS on. Stylish, lightweight design; robust and water resistant - comfortable fit designed for premium performance. EasyView display with brilliant sapphire screen - wide-angle, high-contrast screen for superior readability. Wrist-based heart rate monitor - highly accurate and convenient CardioSense HR technology.